Pakistan's tourism industry, currently estimated at $20 billion (6.9% of GDP in 2016), is booming, according to data available from multiple reliable sources. World Travel and Tourism Council (WTTC) forecasts it to grow to over $36 billion within a decade. Pakistan tourism industry generates $20 billion in revenue and supports 3.6 million jobs directly and indirectly, according to the World Travel and Tourism Council. Foreign visitors generate nearly a billion US$ in exports. 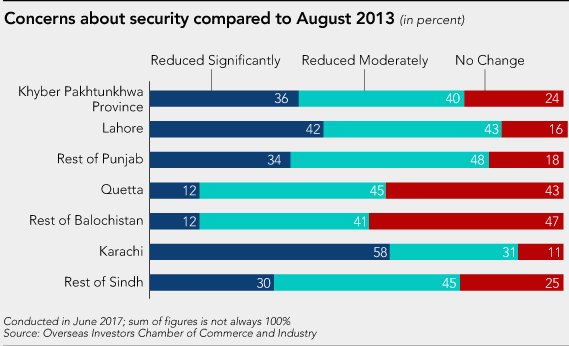 Significantly improved security situation has helped boost annual tourist arrivals in Pakistan by 300% since 2013 to 1.75 million in 2016, while domestic travelers increased 30% to 38.3 million, according to the state-owned Pakistan Tourism Development Corp. Hotel bookings increased 80 percent in 2016, according to Jovago, Pakistan’s biggest hotel booking website. By contrast, foreign tourist arrivals in the country’s larger neighbor, India, jumped from 6.97 million in 2013 to 8.8 million in 2016, according to Indian government figures. 88% of India's and 92% of Pakistan's tourism revenue is domestic. India's tourism industry is worth $209 billion (9.6% of of GDP in 2016), according to WTTC. A story in the Financial Times, a British newspaper, quotes British tour operator Jonny Bealby as saying, “While I am sure this will raise some eyebrows, we are starting to see a marked increase in tourism to Pakistan". Bealby's company arranged 55% more clients to Pakistan in 2017 compared with 2016, and advance bookings are more than 100 per cent up on this point 12 months ago, according to the Financial Times. British Backpackers Society has recently ranked Pakistan as its top destination for adventure tourism. The Society describes Pakistan “one of the friendliest countries on earth, with mountain scenery that is beyond anyone’s wildest imagination”. Pakistan's northern areas are a top destination for adventure-seekers interested in mountain climbing, white water rafting, extreme kayaking and helicopter skiing. 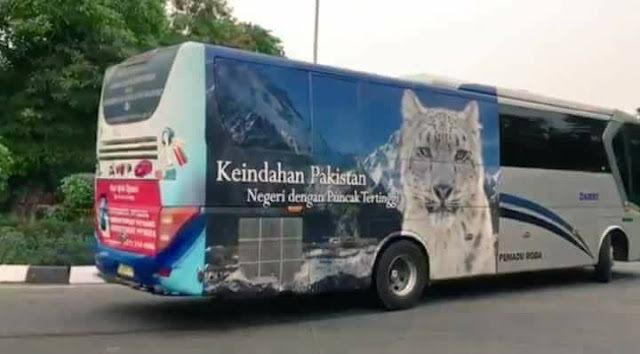 Pakistan government's tourism campaign — including covering buses in several major world cities with beautiful pictures of Pakistan's tourist attraction — have helped raise the country’s profile. Increased investments in roads, airports and other infrastructure have helped ease travel. 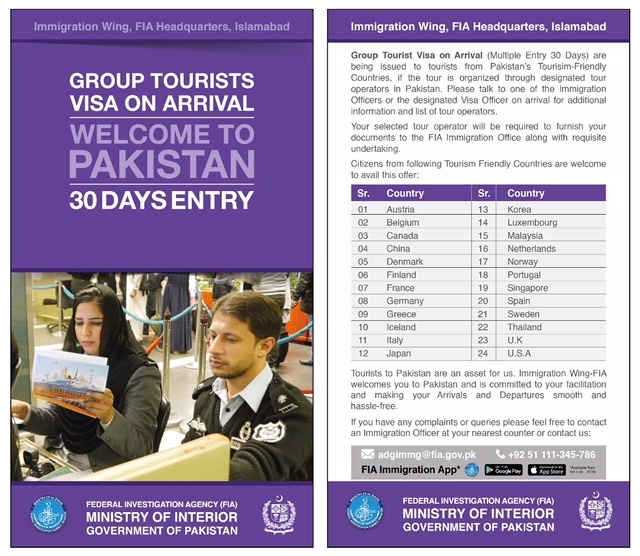 Pakistan government has announced its decision to provide 30 day tourist visa on arrival for visitors from 24 countries on three continents. Tourism industry in Pakistan is booming with 300% increase in foreign tourist arrivals since 2013. It contributed $20 billion (6.9% of GDP in 2016) and supported 3.6 million jobs in 2016. World Travel and Tourism Council (WTTC) forecasts it to grow to over $36 billion within a decade. Its just a start . For a scenic country like Pakistan $ 20 Billion is nothing, only one billion revenue from foreign tourist is shameful. What can be done is to develop the tourist sites to facilitate tourist, that includes development of infra structure , tourist safety and arranging events that would attract foreigners. 92 % of tourists were domestic clearly stating the fact that people's purchasing power has increased over last 3 to 4 years. Government needs to work on this. I hope that development of major tourist resorts along the coastal highway near Gwadar can also help earn large sum of money. They should arrange major events near the Himalayas attracting millions of mountain lovers from across the globe. Timely article. with relaxed visa regime for foreign group' tourists it will only get better. Hope the agencies can take care of law and order as groups are always easy targets.Riaz sb.you are doing great service to the qaum. hope the agencies can recognize your efforts and include you in local think tanks. A British archaeologist, author and civil servant named Hugh Trevor Lambrick, who was the Deputy Commissioner of Larkana in 1940s, called (Shushangi) 'Toshangi' the Grand Canyon of Sindh. It is one of the most dramatic places to visit in the Kirthars. The deep gorge (700ft deep) is formed by the waters of Kenjhi River which has been flowing in the area since time untold. Salman Rashid, Travel writer, Fellow of Royal Geographical Society traveled in 1996 to this place from Ghaibi Dero (Shahdadkot Sindh). Relative to regional competitors for tourism #Pakistan has good urban infrastructure, historical sites within major cities, decent hospitals, good highways, & magnificent natural beauty within 2 hrs of major cities. Easy visas, int'l marketing, & more mid-level hotels would help. Perched on scaffolding, restoration experts chip away at decades of grime and repair broken mosaic tiles in a bid to save the colossal murals depicting historic battles and regal ceremonies on the walls of Lahore fort. The painstaking work is part of efforts to preserve Lahore's crumbling architectural history as officials juggle conserving its diverse heritage with building modern infrastructure in Pakistan's chaotic second city. The metropolis, which once served as the capital of the Mughal empire that stretched across much of the subcontinent, has been subsumed into a myriad of civilizations across the centuries. This rich past is most visible in the milieu of architecture salted across the Walled City of Lahore—from Hindu temples and Mughal forts to Sikh gurdwaras and administrative office built during the Raj. "You get a history of a thousand years, 500 year-old houses and monuments and mosques, shrines and a very peaceful atmosphere," says Kamran Lashari, director general of the Walled City of Lahore Authority (WCLA). Prime among them, and dating back to the 11th century, the Lahore fort was first built of mud and was then later reinforced with stone over the centuries by a long cast of Mughal emperors who oversaw its expansion and the accompanying artwork. But periods of conflict along with searing heat, monsoon rains and years of neglect have taken a toll on the fort. Despite the onset of decay, experts suggest the city's vast Islamic architectural heritage could make it a contender to rival more established Silk Road travel destinations. "Lahore can easily compete with Samarkand. It nearly matches Ispahan," says Sophie Makariou, president of the Parisian-based National Museum of Asian Arts. Makariou adds that its failure to shine is more to do with safety concerns that have plagued the nation after multiple attacks. "Due to the bad reputation of Pakistan, it remains unknown," she explains. But as security across Pakistan continues to improve, officials are hoping to revive Lahore's lost glory. More than 40 conservationists with the the WCLA—including engineers, architects and ceramists from across the globe—are currently working on restoring the mosaic mural on the fort's exterior. "It's one of the largest murals in the world. It contains over 600 tile mosaic panels and frescos," says Emaan Sheikh from the Agha Khan Trust for Culture. Restoration of the mural is just part of a larger project to refurbish the fort, which includes conservation projects in the royal kitchen, the summer palace and a basement, according to WCLA's director general Kamran Lashari. Similar work by the WCLA has already been done to revamp the artwork at the historic Wazir Khan mosque and the Shahi Hammam—one of the only surviving Turkish Baths in the subcontinent that is approximately 400 years old. The city's famed Delhi Gate, which once hosted extravagant Mughal processions arriving in Lahore from the east, has also been fully restored along with dozens of homes in the Walled City. Many of those involved in the project are optimistic. "The cities which are most famous for tourism, you can take London, Madrid, Istanbul, Rome, all the prerequisites which are available in those cities, are available in Lahore," claims Ahmer Malik, head of Punjab's tourism corporation, referring to Lahore's architectural and cultural attractions. Pakistan (Reuters) - When British colonial rulers hastily left South Asia at Pakistan’s painful birth in 1947, the ensuing chaos and violence meant little attention was paid to the architecture they built or influenced in Pakistan’s biggest city, Karachi. ”Every brick of the heritage building narrates a story of those who left in 1947,“ said Akthar Baloch, a researcher who has written several books on Karachi’s heritage. ”They built them with love and affection. Since the start of ground work on the China-Pakistan Economic Corridor (CPEC), the flagship multi-billion dollar project of “One Belt and One Road Initiative," more than 39,000 Chinese came to Pakistan in past five years. More than 92,204 visas were issued by the government of Pakistan to foreign nationals in an apparent effort to expand foreign investment, business opportunities and tourism in the country during this period. Over 120 Pakistani missions abroad issued 29,622 visas to foreign nationals in 2013, 10,267 visas in 2014, 22,932 visas in 2015, 13,456 visas in 2016 and over 15,927 foreign nationals came to Pakistan in 2017, revealed official data/documents Geo News has had exclusive access to. As many as 7,859 Chinese were issued visas in 2013, the starting period for the CPEC projects soon after the incumbent government of Pakistan Muslim League-Nawaz (PML-N) came into power. Following this development, Pakistani missions in China issued over 7,859 visas to Chinese citizens in 2013, 69 visas in 2014, 13,268 visas in 2015, 6,268 visas in 2016 and according to informed officials at Ministry of Foreign Affairs that estimated 12,287 visas were issued to Chinese nationals by the authorities last year. In addition to it, officials revealed to this correspondent that about 91,000 Chinese nationals visited Pakistan on tourist visas in past five years. Some 27,596 visa extensions were also granted to Chinese on recommendations of ministries of interior, foreign affairs, water and power and planning and development, a 34 percent increase as compare to 2015-16, added the officials. This frequent flow of foreign nationals encouraged foreign direct investment (FDI) which jumped 163 percent to $222.6 million in July 2017 on a year-on-year basis, revealed official data collected from the State Bank of Pakistan (SBP). The main contributor to this foreign net inflows has been China, which is investing around $60 billion under the CPEC's initiative. Pakistan received $2.4 billion in 2016-17, highest since the PML-N government took the charge of the state’s economic affairs while FDI remained $1.45 billion in previous PPP regime. The government under Prime Minister Youth Programme also trained over 110,000 youth, majority of them as the authorities claimed, would be associated with CPEC projects in coming years. For security of these Chinese workers, the government of Pakistan has also deputed an estimated 37,000 security personnel to guard Chinese workers engaged in some 22 projects directly associated with the CPEC and 214 other small and mega projects in Pakistan. For this purpose, the government has deployed 15,780 military personnel trained under umbrella of the Special Security Division (SSD) and the Maritime Security Force (MSF). Balochistan would get more security, as a few wings (450 personnel) of the MSF for coastal area, six wings (6,700 personnel) of the Frontier Corps, 3,210 police constables and 1,320 Levies personnel would guard all the routes. More than 4,200 policemen, 1,290 Rangers, 5,500 private security guards and 740 Askari Guards would protect various projects linked to the economic corridor in Punjab. Official data continued to reveal that Pakistan issued visas to 1,505 Australian nationals in 2013, 549 visas to Germans in 2013 and 575 visas were issued to German nationals in 2017. The Pakistani Embassy in New Delhi also issued over a thousand visas to Indian nationals in 2013 and 584 Indians were given Pakistani visas in 2015. As many as 786 Iranians were issued visas in 2013 and 945 visas were issued by Pakistani missions in Iran in 2016. Pakistan has 116 diplomatic missions in other countries. This figure includes 85 embassies, 29 consulates and 2 permanent missions. Pakistan ranks 27 in the world and 7th in Asia on Lowery diplomacy index. India has 181 missions including 124 embassies and 48 consulates. India ranks 12th in the world and 3rd in Asia on Lowery Diplomacy Index. United States is number 1 and China is number 2 on diplomacy index. US has 273 diplomatic missions while China has 268. France ranks 3rd, Russia 4th and Japan 5th in the world. When the British Backpacker Society released its list of 20 adventure travel destinations for 2018, the top spot was taken by a somewhat surprising entry: Pakistan. Citing "mountain scenery that is beyond anyone's wildest imagination" and the friendliness of the locals, the society says the South Asian country will change "every preconception that you ever held about this area of the world." So is Pakistan ready to step up? Though the country was a tourism hotspot in the 1970s, recent decades have spawned plenty of fears about Pakistan travel, owing to political instability and terrorist attacks. But though threats remain and there are indeed places travelers should avoid -- the US State Department still advises its citizens to reconsider traveling there entirely -- improved security backed by a government-led push to promote tourism means visitor numbers are on the rise. In 2017, an estimated 1.7 million foreigners visited Pakistan, 200,000 more than the previous year. In January 2018, it was announced that the country would be offering a multiple-entry 30-day visa on arrival to tourists from 24 countries including the US and UK. Bookings are up 100% this year for Wild Frontiers, a tour operator based in the UK and US that have been running trips to Pakistan for 20 years. For founder Jonny Bealby, it's not difficult to see why the country is appealing to travelers once again. "I call it adventure travel's best-kept secret," he says. "For the adventurous traveler it offers so much. More epic accessible landscapes than you will find anywhere else, meaning landscapes you drive to rather than trek for days to. "In Hunza [a mountainous valley in the Gilgit-Baltistan region] for example, you can sit on the rooftop at your hotel having breakfast and you've got seven 7,000-meter peaks all around you, which is pretty incredible." Bealby also points to the country's interesting cultural allures -- both in terms of architecture and people. "The cuisine is of course great and the hotel accommodation is actually a lot better than most people think," he adds. "Tie all those things together and you've got the perfect adventure travel destination." According to Bealby, tourism in the north of the country has not yet been restored to Pakistan's heyday during the early to mid-nineties when hotels would need to be booked at least a year in advance, yet he has certainly noticed a change in attitudes in recent years. "I would say that the security situation in Pakistan has improved radically in the last three years and it is now becoming a real possibility for people that previously might have been too wary of going to a place which they felt was unsafe." For US-born travel blogger Alex Reynolds of lostwithpurpose.com, who has visited the country twice, the things she read were not enough to put her off. Berlin's iconic yellow buses are carrying brand Pakistan on the streets of the city on nation's 72nd Independence Day. This branding campaign is running under the theme of 'Emerging Pakistan'. Berlin caters to hundreds of tourists, especially during the summertime, who will get to see these buses daily. 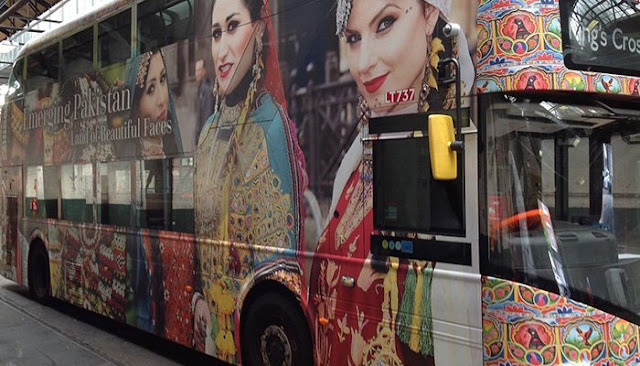 For a brief time, many Berliners will see these buses portraying the diversity and beauty of Pakistan. Speaking to this correspondent, Jauhar Saleem, Pakistan's Ambassador to Germany said, "We are endeavouring to showcase beautiful Pakistan, perhaps the best-kept secret in the world of tourism." These special buses showcase the natural beauty of Pakistan with its highest peaks, majestic landscape, Made in Pakistan Football used for FIFA World Cup Russia 2018, monuments representing ancient civilisation, magnificent architecture and vibrant and diverse culture. The banners on buses aim to attract foreign tourists to the wonderful land of Pakistan, for many that still remains unexplored. Although for many Germans and Europeans, in particular, northern areas of Pakistan offer a mesmerizing adventure, an ancient Indus civilisation of Moen-Jo-Daro have always fascinated German archaeologists and researchers. Also, the culture and the ethnic richness of Pakistan is appreciated all over Europe. The picturesque winter resort of Naltar in Gilgit Baltistan and the enchanting ski slopes of Malam Jabba in Swat brace for some exhilarating winter sports in the coming days. The Winter Sports Federation of Pakistan (WSFP) has chalked out an elaborate calendar of events for the season. The winter sports season has already commenced at Pakistan Air Force (PAF) Naltar with Sadia Khan & Children Ski Cup this week. Besides, snowboarding and ice skating, ice hockey competitions would also be held there for the first time in the country. Other than these, Shah Khan Ski Cup and Joint Chiefs of Staff Committee Championship would be held. This year, inter-varsity championship for men and women have also been planned to promote winter sport in the educational institutions of the country. Alongside PAF Naltar, Malam Jabba Ski Resort would host National Ski Championship, Malam Jabba Ski Cup and CAS International Karakoram Alpine Ski Cup. WSFP has chosen the recently developed Rattu Ski Resort to host two events this year, including inter services ski cup and National cross country ski cup. Prominent international skiers from across the world are arriving to participate in different ski racing categories. Besides international athletes, top level national skiers would take part in these races to showcase their talents in this exciting sport. Competing with the famous skiers of the world would provide an excellent opportunity to Pakistani athletes to learn from their competitors and improve their standing in the world rankings. The match was played between the teams of Pakistan Air Force and G-B Scouts. Players from both sides showed some extraordinary skills but no team could score a goal within the stipulated time. The fate of the match was decided on penalty shoot-outs, in which Shahsyar scored the only goal of the match, paving way for a PAF win. The history of ice hockey in Gilgit-Baltistan region could be related to a local game, called ‘Ghatal’, which is also played with two sticks and a ball. To continue the legacy of this traditional game, ice hockey has been introduced in the region. Earlier, the Winter Sports Federation of Pakistan (WSFP) chalked out an elaborated calendar of events for the 2018-19 season, according to a PAF spokesperson. In a statement, he said the winter sports season has already commenced at PAF Naltar with Sadia Khan and Children Ski Cup this week. Besides snowboarding and ice skating, ice hockey competitions will also be held at the venue for the first time in Pakistan. To continue the legacy of this traditional game, ice hockey has been introduced in the region. Earlier, the Winter Sports Federation of Pakistan (WSFP) chalked out an elaborated calendar of events for the 2018-19 season, according to a Pakistan Air Force (PAF) spokesperson in a statement issued in Islamabad on Friday. KARACHI: With its scenic view, Pakistan 's Kund Malir beach is one of the most exotic beaches and definitely one of the top tourist attractions in the country. Kund Malir beach now among Asia’s Top 50 Beaches. This extremely beautiful and untouched shoreline rests between the desert, mountain and sea, making for some breathtaking views at the bottom edge of Hingol National Park. This golden beach, with its unparalleled serenity and so much more, is a must-see destination Pakistan. Venture off the coastal highway to relax on the smooth sands by the Arabian Sea. This exceptional, natural marvel of the world is where the water meets a desert. It is an attractive desert beach with palm trees on the coastline. As this place has gained popularity recently by featuring into the top 50 beaches of Asia, Kund Malir is a clean beach with crystal clear, shimmering water. The FlightNetwork’s most in-depth list of Asian beaches provides a complete look into the stunning shores of Asia – a continent with countless countries rimmed by aquatic wonders so extraordinary travelers must see to believe. The Asia’s Top 50 Beaches list was prepared by collecting the insider knowledge of over 600 journalists, editors, bloggers, and agencies, who have made travel their life. The resulting expert guidance ensured the list of Asian beaches offers those that have a taste for adventure, balanced by ultimate relaxation, all the needed insight to plan an unforgettable beach-side journey. Following the fast improving ranking of country in tourism, Terres d’Aventure, a French tour agency specialized in adventure travel, hiking and trekking has decided to re-programme Pakistan, after a decade. According to an article appeared in French magazine Tour Mag, the tour operator would propose four trips, ranging from 17 to 24 days, intended for lovers of high mountains. “A hike for 13 days along the Baltoro glacier to the famous Concordia site, then on to the base camp of K2, the most beautiful mountain in the world according to mountaineers, and then to Gondogoro La (5 585m), from where one can view an exceptional panorama of four eight thousanders, K2, Broad Peak, Gasherbrum I and II”, the tour operator said. “With few steep passages, this trek offers a gradual acclimatization and presents no major difficulties, offering exceptional views of 14 peaks over 7000 meters and vast glacial landscapes,” added Terres d’Aventure. Established in 1976, Terres d'Aventure is one of the top French adventure travel agencies. In a statement the agency said: “Au-delà des clichés relayés par la presse, et sans nier certaines difficultés politiques, nous recommandons le Pakistan pour ce qu'il est réellement : un peuple qui a beaucoup à offrir, et qui aspire à la paix et à l'ouverture sur le monde. Plusieurs régions sont sûres, notamment le Gilgit-Baltistan, et les autorités sont mobilisées pour assurer la sécurité des populations et des visiteurs”. Well this is well crafted article, Pakistan had real potential of boosting it's tourism industry, before 9/11 tourism industry was contributing since then extremism killed that industry. Now it's reviving again, we hope travel companies Pakistan Tour Packages will create an industry with sustainable tourism. Jane Westwood (Wild Frontiers) says that bookings for Pakistan tours have increased significantly during the past two or three years, an assertion that’s backed up by official tourism statistics. In 2015, Pakistan welcomed 563,000 overseas arrivals. That figure grew to 965,000 in 2016, 1.6m in 2017 and 1.9m last year. Some of those will be expats of Pakistani heritage visiting friends and family, but it is suggestive of a destination finally about to live up to the oft-applied billing of “tourism’s next big thing”.